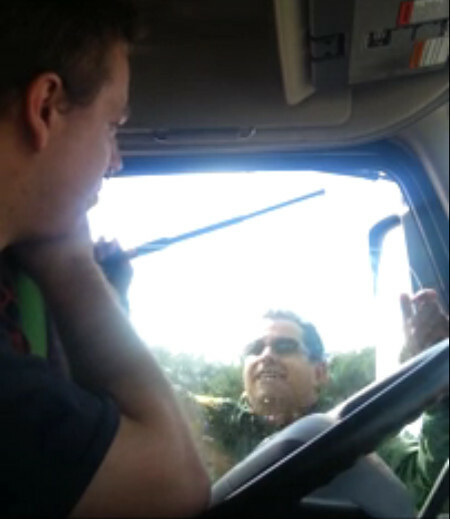 While being seized & detained at the roadblock for peacefully & lawfully exercising his right to not answer investigatory questions, the trucker’s window was busted out by U.S. Border Patrol Field Supervisor Lial. Lial then had his lackeys drag the trucker out against his will. 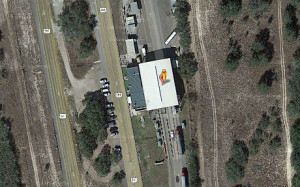 After the trucker was removed from his vehicle, Lial rushed in and seized the video camera that had recorded the assault. At this stage, one would expect that if Lial thought his actions were necessary & lawful, he’d want to preserve the video footage as evidence of the trucker’s illegal actions & to show Americans how The U.S. Border Patrol is serving & protecting us at suspicionless roadblocks inside the country. If on the other hand, Lial was embarrassed/ashamed of his words and/or actions or wanted to cover-up his malfeasance, one would expect that Lial would attempt to stop the camera from continuing to record while destroying video evidence that had already been gathered. Can you guess which choice Lial made? 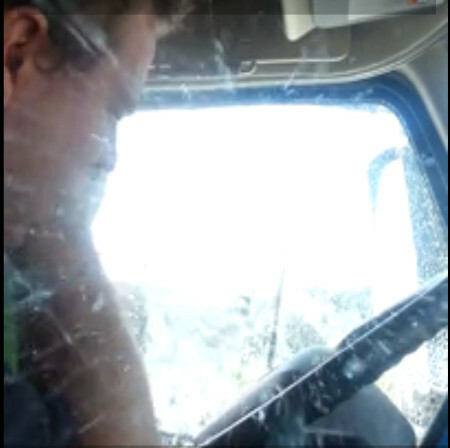 After the trucker (going by the name of Thomas Sauer on youtube), was released without charges and his camera returned to him minus the video, he was able to retrieve the deleted footage using commercial data recovery software and post the video of his encounter on youtube. In the video, the trucker’s initial interaction at primary takes place at about minute 3:40. The agent at primary asks the trucker something that I can’t quite make out and the trucker responds by saying, “I’d rather not”. In short order, the driver moves his truck to secondary at the direction of the agent at primary. Several more minutes pass before Field Supervisor Lial climbs up onto the truck near minute 6:14 & begins interrogating the driver. The driver asserts his right not to answer investigatory questions however and requests to know on what basis Lial is extending the detention. Amazingly enough, Enforcer Lial claims he’s detaining the driver for impeding him under 18 USC 111. I say ‘amazingly’ because anyone with any understanding of the law would quickly realize that Lial’s claim of an 18 USC 111 violation within the context of this video is bogus on its face – something a field supervisor such as Lial either knew or should have known at the time. When All Else Fails, Silence The Messenger…. 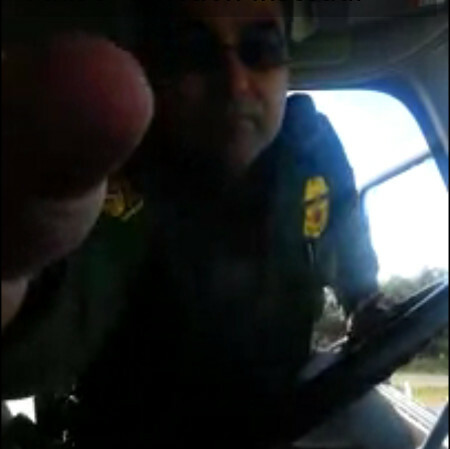 Given the government’s official interpretation of 18 USC 111, it’s clear the truck driver was more knowledgeable of the law than Field Supervisor Lial making him look foolish for condescendingly asking the trucker if he was an immigration inspector during the encounter. During the encounter, Lial also referenced the Immigration and Nationality Act (INA) as part of the basis for extending the trucker’s detention and eventually arresting him. Unfortunately for Lial, his reliance on the INA to justify his actions in this instance appear to be just as misguided as his reliance on 18 USC 111. Indeed, the U.S. Supreme Court explicitly struck down much of the authority that Congress had given to the Border Patrol in the INA almost forty years ago in a series of cases that culminated in U.S. V Martinez-Fuerte. 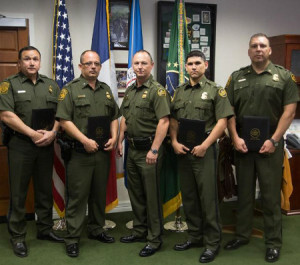 Prior to the mid-1970’s, the Border Patrol had been using the INA to conduct suspicionless roving patrol and checkpoint stops inside the country. During these stops, agents would interrogate travelers regarding their immigration status and sometimes search them and their belongings absent suspicion. Eventually, four cases challenging this authority on constitutional grounds percolated up to the U.S. Supreme Court. Two of the cases, U.S. V Brignoni-Ponce and U.S. V Almeida Sanchez, challenged the authority of roving patrols to conduct stops and searches absent suspicion. The remaining two cases, U.S. V Ortiz and U.S. V Martinez-Fuerte, brought forward the same challenges at internal checkpoints. For both roving patrols and checkpoints, the U.S. Supreme Court stripped the Border Patrol of its authority in the INA to conduct searches absent consent or probable cause at locations removed from the actual border or its functional equivalent. Similarly, the court required the presence of at least reasonable suspicion before a Border Patrol agent could conduct a roving patrol stop to ask vehicle occupants about their immigration status. 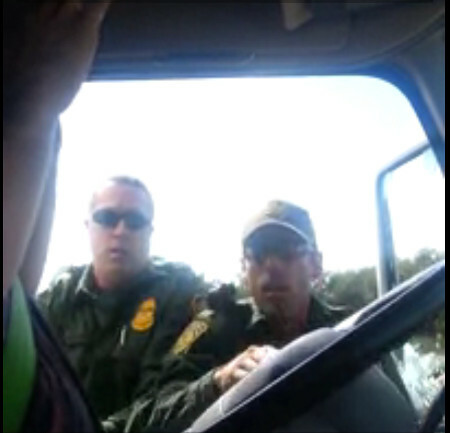 It was only in U.S. V Martinez-Fuerte, the last of the four cases, where the court threw the Border Patrol a bone by allowing very brief stops at permanent checkpoint installations setup along nexus points for border traffic to ask a few immigration-related questions absent suspicion. 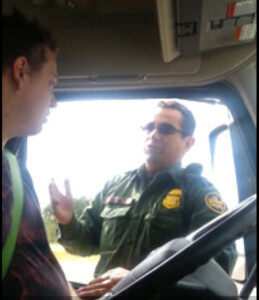 Given this history and the very real limitations the courts have placed on the Border Patrol’s authority under the INA over the years, Lial’s false claims that he’s not seizing the trucker, that the trucker must answer his questions and that he can detain him indefinitely until he’s satisfied regarding the immigration inspection appear to be patently false. False since at least 1976 when the U.S. Supreme Court clarified the constitutional issues associated with enforcement of the INA, internal immigration checkpoints and roving patrols. It should be noted that Robert Harris was also the Chief Patrol Agent in charge of the Del Rio Sector when active duty air force pilot Richard Rynearson was illegally detained and harassed at a Border Patrol checkpoint near Uvalde, Texas several years ago. An encounter where Harris wrote a letter to Rynearson’s command complaining about Rynearson exercising the very rights that Harris’s subordinates were supposed to be protecting in an obvious attempt to get Rynearson in hot water with the military.